The Sigfox network provides a backend service where all Sigfox network devices messages are received and where the client/customer can pick up data from it’s own devices through Sigfox provided REST API. But using the REST API means that we need to pool for messages availability, which is not very efficient. 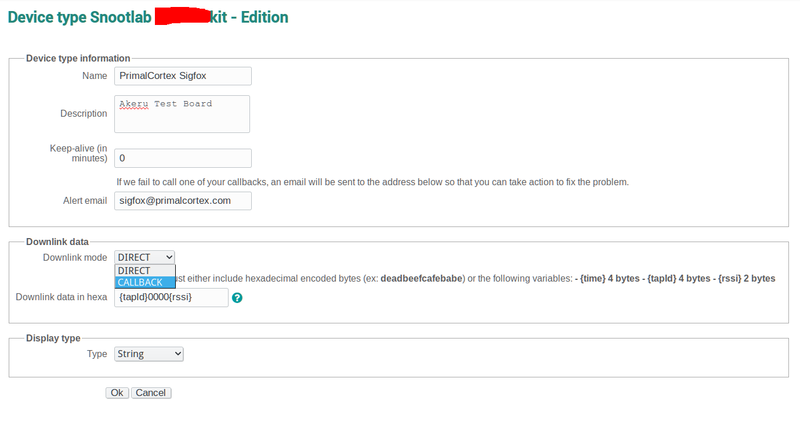 Another alternative provided by the SigFox backend is a callback mechanism. The callback mechanism can be done through email, where the data is sent by email to the destination, or through an HTTP call to a client/customer owned server. In my case I’ve used a open access IBM Node-Red Server available on the Internet as my own callback server, to process the call backs. 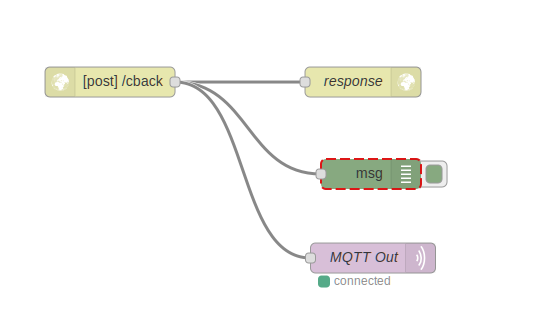 With IBM Node-Red we can easily bridge the HTTP callback call to a MQTT topic publish. With this HTTP-MQTT bridge it means that every HTTP callback generates an MQTT publishing event, and so any subscriber listening to the associated topic receives the Sigfox message. From here we can now do whatever we want, and still using Node-Red, we can process the data, or store the data on databases, like InfluxDB where we can then use Grafana to graph the data. Callbacks to the client/customer private server can be of type Uplink or Bidirectional. In the first case the private server just receives the data. On the second case the backend server, receives the data and responds with something meaningful that is sent to the device, if the device asked for a downlink response. The response of the private backend server to the Sigfox backend server must be under 10s, otherwise the Sigfox servers will call one more time before raising an error. Also the downlink responses to the devices are, as far as I’m aware, not sure on this, limited to 12 messages per day. Otherwise, when direct mode is defined, the access point ID and RSSI is returned. 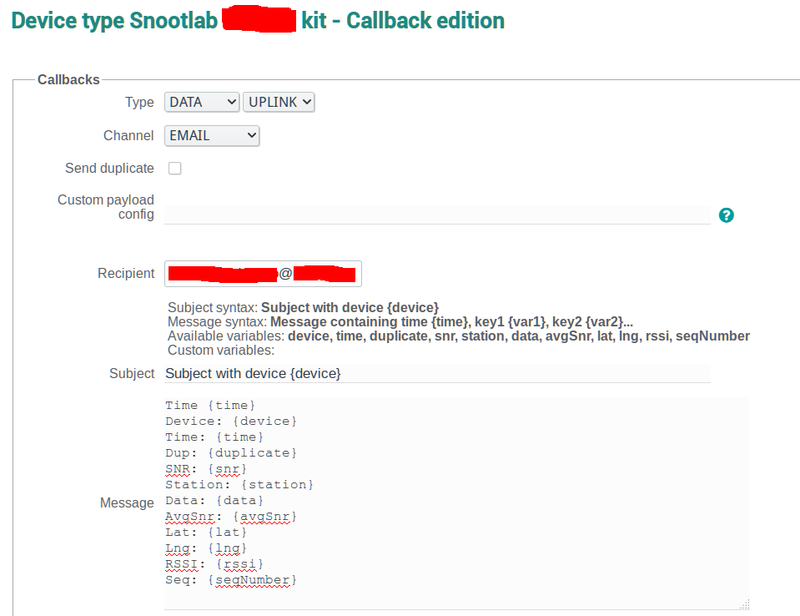 Also for the HTTP callback, there is the possibility of a HTTP batch callback, where several device messages that arrive in one second at the Sigfox backend, are grouped in a single callback call. This avoids heavy load on the call back private server. 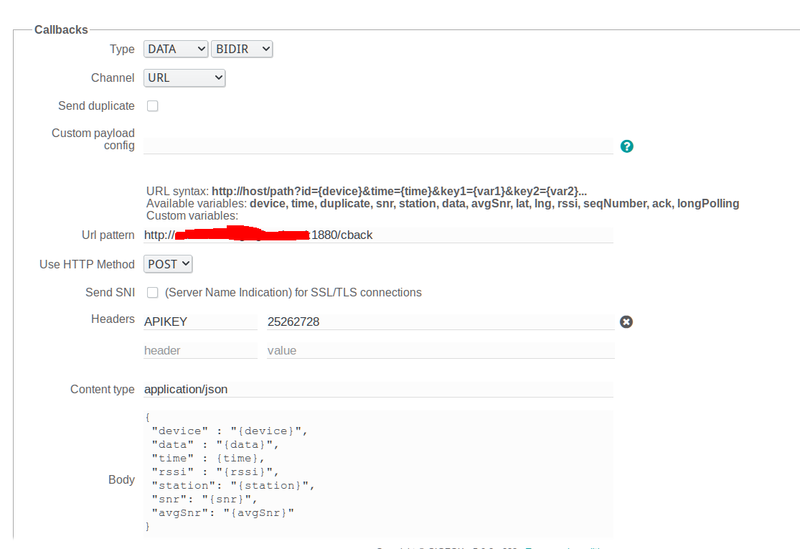 So now every Sigfox message activates a callback to the Node-Red HTTP Post node, and the message is routed to a MQTT out node for the /sigfox/messages topic. So all is needed now is to process the data field from the JSON object and do something with the data. So I’m doing some tests with the SigFox enabled Akeru board. This board has an ATMega 328, with bootloader, that makes it compatible with Arduino, and also has a SigFox TD1208 modem connected through serial to pins 4 and 5. From every aspect that we can think this board, excluding the reserved 4 and 5 pins, works as a standard Arduino Uno R3 board, or clone. The TD1208 chip, that enables communication with the SigFox network also has some other features available. One of them is the capacity to form some kind of a short range wireless based network with a maximum of 15 devices. This capability allows communications with, probably, other TD1208 chips and family (TD12XX), for a local wireless sensor network where one of the TD1208 devices act as a centralized gateway.. Since I don’t have any other TD1208 chips or boards with that chip or with compatibility for this network, I’m unable to try it. But it is worth a mention. Also the TD1208 chip has an embedded ARM processor, which means that the TD1208 can be used by itself without the Arduino part. Still the Arduino way to use a serial port to communicate to the TD1208 chip is way easier that develop a native program for the TD1208. Check out this link for further information: TD1208. With this board there is nothing special to be done to send a message to the SigFox netowrk, and receive it at the backend. Still there are some things worth mention. // The frames are a maximum of 12 hexadecimal bytes. We can see that (*1) there is a delay. I’ve found out that without the delay, at powering up the board (Not Reset!) the command to send data to the SigFox network fails. So this means that at power up, the TD1208 isn’t ready right away, and need some time to boot up. This makes sense since it has an ARM processor inside. Resetting the Arduino board, seems not to reset the TD1208, so without the delay, the above code doesn’t work at power up, but works fine after reset. Sending data is also worth some mentions. Data can only be in Hexadecimal numbers, so bytes are from 0x00 to 0xFF. The data is accumulated until the final new-line character: \n. Spaces are ignored. This according to the TD1208 data sheet, will send the message twice to the network in probably two different frequencies. Since I live in a dense urban area, results are excellent, but I’m not aware of how many gateway/base stations that I have at my area. I’ve only missed messages sent from underground (parking space), and even on of this cases, one of the messages did arrive, very weak, but it did. Three things need to be done: A backend for processing the messages, but that is very easy to do with Node-Red, how to define, if possible, the downlink message, and how to enable and process events from the TD1208. The TD1208 supports events for monitoring battery voltage, RSSI, temperature, but it seems it is for a TD1208 LAN based topology, not for the Sigfox network. I was able to attend the SigFox Maker tour in Lisbon: SigFox Makers Tour, where Sigfox explained what it offers, and allowed a hands on approach to long range/low power communications by using a evaluation board from SnootLabs, the Akeru Beta 3.3. As we can see from the previous link, this is an expensive way of entering the long range/low power communications field, so it came (more or less) as a surprise that the board could be kept by the attendees. SigFox is not alone on this market of M2M (machine to machine communication) where low power and long range is needed. Other contenders are the LoraWan alliance (Lora Alliance) with one open source, crowed sourced network in the making: The Things Network, the more closed Weightless M2M, and many others, like future 5G and LTE-M. Anyway, this is not the main topic of this post, let’s see the what SigFox is all about. Why long range and low power is needed for IoT? IoT is a greater set of a smaller subset of machine to machine communications (M2M from now on). IoT implements the structure, the applications over the devices that communicate and generate data. Think of Google or NetFlix as the IoT part, and TCP/IP, cables, fiber, as the M2M part. IoT can’t exist if devices can’t communicate. But most of the communication forms existing today requires power and vicinity to a communication gateway. Wifi devices need to be near a Wifi access point, Bluetooth, the same, other forms of communication, like Zigbee also need this. They also need large quantities of power, connected to mains, or need to have batteries to be recharged frequently. So a solution for long range: distance between the device and the gateway can be Kms/Miles, and low power, batteries last years, is needed. Just set a device with what sensors is needed, and it communicates for years using batteries and without any more intervention. A great explanation of the SigFox solution is on these slides: SigFox Basics. In short, SigFox protocol uses the ISM (Instrumental,Scientific,Medical) radio band ( 868MHz in EU, 902Mhz in USA), with a Ultra Narrow band 100Hz signal across a set of 200Khz frequency, where it transmits a 12 byte message (maximum) at a duty cycle of 1% per day. This gives around 140 messages/day. This is enough for transmitting sensor data each 10 minutes. The signal can be received by any base station on the vicinity, and is delivered to the SigFox backend, where is deduplicated, if necessary. At the back end the message can be delivered to the final destination either by email (not very useful) or by an HTTP callback. The HTTP Callback is the process where the SigFox backend servers call your web server, available on the internet, either by http:// ou https:// with a specific set of configured parameters on the http request. At least with the provided board (the Akeru) the power consumption when transmitting is around 25mA and the it drops when idle to very low values, almost negligible. And this is not the most efficient platform. Also, I’m sure that I’m several Kms away from the gateway. Compare this with the ESP8266, where it uses around 150/300mA when communicating and needs to be around the access point in meters!. The tests that I’ve done so far where always successful in dense urban areas, and inside buildings. After receiving the board, there is a chip/device id set on top of the Sigfox module. With this id and a PAC (key?) we need to register at the SigFox backend: http://backend.sigfox.com. At the Makers event, things didn’t went well at first with this registration, but after some fiddling from Sigfox part, it went OK. Still I see a major issue here on the provisioning process of new devices, if this process is needed to be done one by one… There is probably another way of connecting/registering devices on the Sigfox backend. After the device is registered, with just one command, we can send data to the network. So a quick hands on: The Akeru board is an Arduino Uno compatible board and behaves as one. So we use the Arduino IDE. The only difference is the TD1208 SigFox modem (if we can call it that) on board, and with the serial lines connected to pins 5 and 4. The following Arduino program, loops over the serial ports, and allows to use the computer to communicate with the TD1208 module across the Arduino board. The ATI command can have some parameters, like 26, the current environment temperature, 27, the current voltage level, and 28, the voltage level when transmitting, when it’s drawing power from the power source. After reboot and without any transmission made, the ATI28 command returns zero. ATI28     <- Voltage when transmiting. Is zero after restart. AT$SS=10203040  <- Send message 0x10 0x20 0x30 x040 to the network. As we can see the received signal strength (RSSI) at the receiving gateway was at an amazing -134.20 DBm!! This is an extremely low power signal. Wifi stops working around -80DBm, and that is at distances around meters. The Akeru board works fine and it’s easy to program. Still navigating the backend side is a bit of an hit or miss (topic for other post), but its functional. Due to the network coverage on all Western Europe, free roaming for the devices, low power and long range, SigFox offer can make a dent on solutions that depend on GPRS or other competing solutions. This means that Sigfox is a readily available solution for some Enterprise/Startup uses/solutions that need low power, long range and free roaming with an established network. Still the pricing for access the network is opaque (1€ to 20€/year, but per device, number of devices, company,startup?). Also the maker community that is not able to access these Maker tours, where the hardware is free and can be kept, has a steep entry price. The entry kit is expensive and only offers a one year free fee to access the network. This can hinder the investment on the SigFox solution from individual Makers, and that, in my opinion, is the major issue.